Let us provide the fun! Each casino event is customized to your needs! to the largest events and fundraisers! Casino Parties holds popular casino events throughout the Pittsburgh area for private parties, fundraisers, and corporate special occasions. We’re Pittsburgh’s most popular casino party choice because we make everything fun and easy, from theming and decorations, to staffing and entertainment add-ons. We’ve been planning entertaining events for more than 50 years, and we want to help make your next casino event or party a huge success. the casino pit boss and professional dealers. training if you’d like to use your own dealers. All that you’ll need to provide is a table for each game, plus chairs, table cloths, prizes, and if it is a fundraiser, a cashier’s table. Casino Parties of Pittsburgh supplies the entertainment, music, and staff, so you and your guests can have fun and enjoy the party! Our games include craps, roulette, black jack and poker. We can also include sporting games. We start off with providing each guest the same amount of play money (unless it’s a fundraiser – then they pay for play money at the cashier’s table). If players don’t know how the games are played, our dealers will be happy to teach them and explain the rules. Once your casino party has started, we’ll continue to provide services that will make your event one to remember! 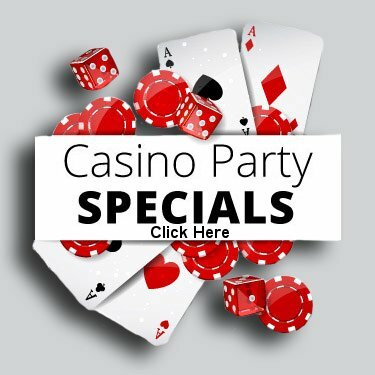 Casino Parties of Pittsburgh can also help you book music, decorate for your casino night event, hire a photographer, or set up a photo booth. There’s a lot more that we can do—just ask. We also offer events such as Night at the Races if you are booking a fundraiser. With our large variety of games, your guests will have a wonderful time. Call Casino Parties of Pittsburgh for first-rate casino entertainment today! Want more information on how you can have a Casino Party at your next event? Fill out the form below and we will contact you to get started.